UPDATE: Microsoft has released a Marketplace template to simplify the process of implementing Parse on Azure. For more details, please see Announcing the publication of Parse Server with Azure Managed Services. As the Parse migration guide suggests, you can migrate the Parse-hosted backend used by your app to another host, with the Parse server API mounted on an Express app. 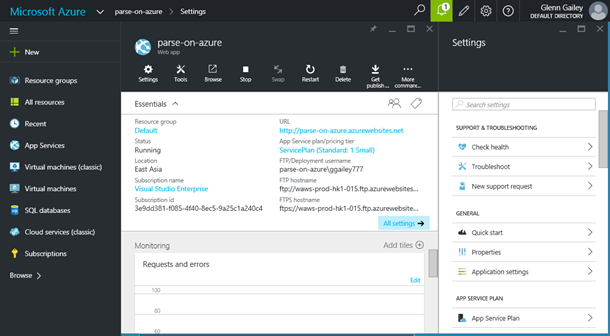 Azure App Service makes a great alternative for hosting your Parse server implementation. 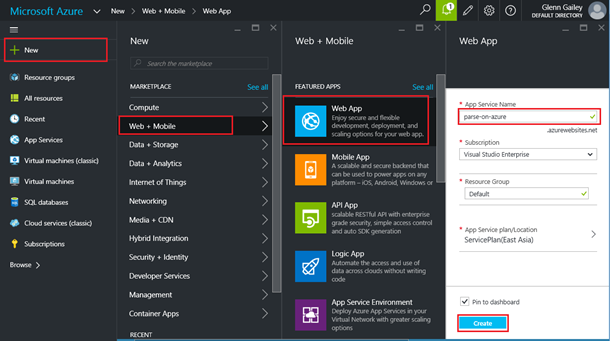 After all, the Node.js backend for Mobile Apps in Azure App Service is also an Express app. 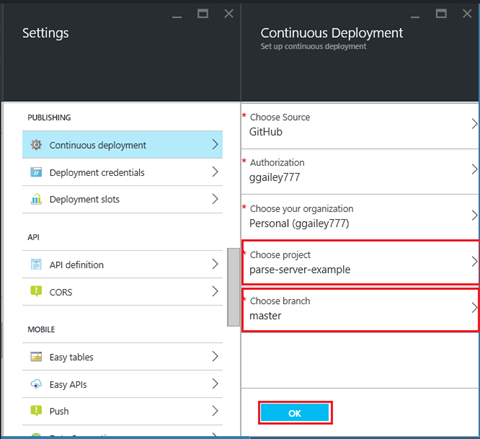 To make things even easier for you to get started, the Azure App Service team has created a streamlined provisioning process that makes it very easy to get your Parse server running in App Service. Before you start, you should probably read through the Parse migration guide so that you can understand what is and isn’t supported by the new Parse server. One major mobile app feature missing from the Parse server is push notifications, but using Azure Notification Hubs is a great alternative there too. When the migration is complete, you can continue to use the Parse client SDKs in your apps accessing your existing data (of course the clients will also need to be updated to use new versions of the SDKs and to point at the new service location). If you don’t already have an Azure subscription, you will need to sign up for one. A free trial subscription is available. One of the current requirements of Parse server is using MongoDB (Parse provides guidance for MongoDB requirements). Parse is also promising a migration tool to enable you to move your Parse-hosted data out to MongoDB. If this is your experience with MongoDB, Parse recommends starting out with the MongoLab service, a fully-managed cloud database service that you can also sign-up for through Azure Marketplace. However you choose to host your MongoDB, you’ll need the connection info to run the Parse server. In the future, you should also consider using Azure DocumentDB, a managed NoSQL document database-as-a-service. In subsequent posts, we will share instructions on how to migrate your data to DocumentDB and use DocumentDB with your Parse server. 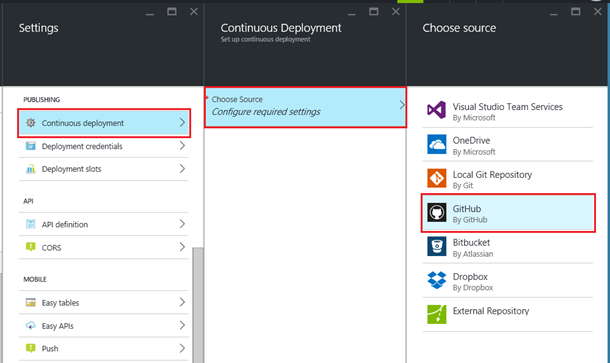 The migration path to Azure demonstrated in this post requires you to have a GitHub account. It is also helpful for you to know how to clone a Git repo and to commit and push changes to the repo. The first step is to create a new backend in App Service to host your Parse server. In the Azure portal, click + New > Web + Mobile > Web app, enter a unique name for your backend, then click Create. This creates the new backend service that will host your Parse server. Before you do this, you may want to create a different App Service plan as this affects the pricing of your service. You can always change your App Service plan later. For more information, see Azure App Service plans in-depth overview. After the initial deployment is complete, you will see the blade for your new backend. App service provides various ways to deploy your app. Next, you will set up a deployment from a Parse server repo. To make it easy to publish a Parse server on Azure, the App Service team has forked the Parse server example repo to create a customized Parse server that runs correctly in App Service. In GitHub, fork the Azure Parse server sample repo into your account. You will use this fork as the deployment source for your backend. Back in the Settings blade for your newly created backend, scroll down and click Continuous deployment > Choose source > GitHub, then click Authorization > Authorize, grant access to the Azure management portal in the GitHub page that is displayed (you will probably also need to provide your GitHub password), then click OK.
Now that the portal is connected to your GitHub account, choose your fork of the parse-server-example as the project, choose the master branch, then click OK.
At this point, the deployment is set up and the Parse server code is pulled from the GitHub project and published to Azure. If for some reason the deployment isn’t triggered, you can also manually trigger a sync by clicking on the Sync button on the Deployments blade. At this point, you should be able to access your new Parse server using a REST client. If your Parse server requires other hard-coded values, such as a Facebook App ID, you should also add these to app settings. Now that you have verified that the Parse server is running correctly on Azure, it’s time to add your cloud code to the deployment. Since you now have continuous deployment configured using your fork of the Parse server sample repo, it’s easiest to use this GitHub repo to add your Parse cloud code to the deployment. To add your cloud code to the deployment, clone your fork of the Parse server sample repo on your local computer using a Git client or command-line tool, like GitBash. From your local Parse installation, copy the /Cloud and /Public subfolders to your new local clone, then add, commit and push the changes back up to your origin in GitHub. When you push to GitHub, you will see that deployment is again triggered. After the deployment completes successfully, your cloud code is ready to use. Please note that this requires you to add your cloud code to a public GitHub repo. To keep your code private, you'll need to duplicate this repository into a private one, or you can first switch to use another deployment method. The new Parse server and new hosting environment requires updates in the Parse SDKs used by your client apps. Make sure you follow the instructions in Using Parse SDKs with Parse Server. Parse Server does not implement any push notification functionality. We recommend migrating to a different push provider. Don’t panic. Azure has a highly scalable service designed specifically to send push notifications to mobile apps, Azure Notification Hubs. As you did with push in Parse, Notification Hubs stores authentication information for each Push Notification Service (PNS), APNS, GCM, WNS, even Kindle, Chrome, and Baidu. The Notification Hubs Node.js library lets you easily send push notifications from your cloud code, or from nearly any other backend service. We will provide guidance in the near future on how to use Notification Hubs to send push notifications from a Parse server. Once you have gotten used to the Azure App Service hosting environment for your Parse server, consider investigating other Azure services that provide some of the features of Parse hosting that are missing from Parse server, like analytics, scheduled jobs, and integration with third-party services like Twillio and SendGrid. App Service also offers more built-in authentication options that Parse server. We hope that you have a great experience in trying out Azure for hosting your Parse server. Best of luck on your migration from Parse hosting to a new backend home for your app.